Looking for a coffee after a busy morning of inspections? This week Street News writer Natalia Smith stopped in at quirky Rubber Duck Cafe. 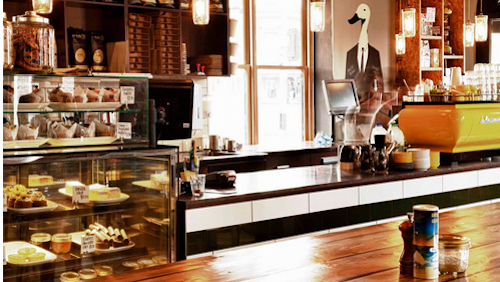 Set inside an old pub building, the Rubber Duck Cafe is plain from the outside except for its quirky name. The inside is entirely different with a warm, bistro atmosphere and duck decor and paraphernalia on display. The owners have opted for a range of interesting displays including graffiti-style ducks in business suits and a more traditional feature wall of flying ducks and local wildlife. The menu is in-keeping with the bohemian feel of the area; freshly squeezed juices are served in jam jars, while steak sandwiches are served with local chutneys and strong coffee. Traditional big breakfast lovers won’t be disappointed by ‘The Big Ducki’ while those fancying something a bit different can try the dill and smoked salmon breakfast crepes or cheddar toasted English muffins. Lunch is expensive but made up for by the use of seasonal ingredients and large portions. The beetroot, thyme and goats cheese tart is perfect, although my friend swore his steak sandwich and house-made chips were better. The staff are friendly, attentive and happy to offer recommendations from the menu. Saturday lunchtimes are fairly busy but the atmosphere has never felt rushed or noisy when I’ve visited. Those visiting with kids under 10 will be relieved to find a simple but healthy children’s menu. As an added bonus, for every children’s meal purchased, $1 is donated to The Good Friday Appeal. Natalia is an avid writer with strong interests in property, home and lifestyle and current affairs. A recent graduate with a Bachelor of Arts (Creative Writing) from the University of Melbourne, she is currently working on her first novel. In her spare time Natalia enjoys engaging with Melbourne's arts and crafts scene and getting involved with her local community.